There’s no need to let your standards slip just because you’re wrapped in layers, with our tailor-made guide to skincare and grooming. 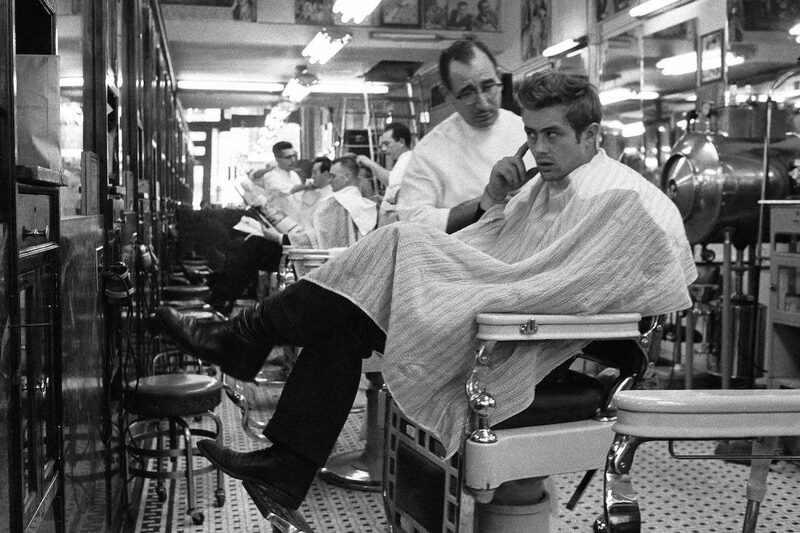 James Dean gets a trim in a barber shop near Times Square, New York, 1955. Photograph by Dennis Stock. Legend has it that sometime in the 15th century, the French invented turtleneck jumpers as a means of better concealing their bodily odours. It may well be ‘sweater weather’ in half the world right now, but that’s no excuse to follow the lead of these apocryphal fragrant Gauls and gear down on the grooming regime. In fact, if anything, winter calls for an increase in the use of lotions, potions and unguents. Outdoors, the wind and cold air chafe. Inside, roaring fireplaces and roasting central heating dry the flesh terribly. Constantly transitioning from one environment to the other throughout the day only exacerbates matters. Our counsel? Start by removing flaky, chaffed skin every few days with a mild exfoliatiator such as Innoxa’s Clean Face Scrub, or for a more intense effect, use a heavier treatment like Neville’s volcanic ash-based Rescue Scrub once weekly. With your skin primed, apply a good moisturiser each morning — Terme di Saturnia’s Spa Moisturising Cream is an intense hydrating lotion that nourishes the skin, soothes razor burn and reduces redness. At night, before bed, rest and revitalise your visage with Chenot Total Recovery Energising Cream, rich with essential oils to invigorate tired skin on the face and neck, promote tissue regeneration and reduce wrinkles. Innoxa’s Nutri-Lift Moisture is another great anti-ageing solution that improves skin health and guards against environmental toxins. Winter presents an excellent opportunity to grow a beard — always a ruggedly handsome complement to tweed, leather jackets and those aforementioned turtlenecks. The fur keeps your chin warm, and taking a break from shaving gives the upper layer of epidermis a much-needed rest. Keep that facial topiary sleek and guard against the horror of beard dandruff (which commonly occurs, as a beard draws moisture away from your skin) by using a quality beard oil, such as Antica Barbiera Colla’s refreshingly orange-scented iteration or Neville’s woody alternative, or perhaps a balm, like David Mallet’s bergamot and yuzu scented version. 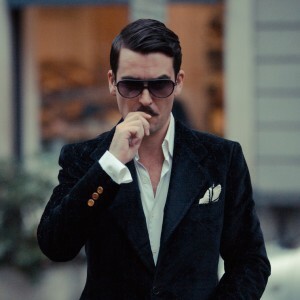 If, however, you insist upon shaving, do yourself a favour and first treat your skin with a pre-shave cream, then generously lather on a moisturising shaving cream (take your pick from various fragrances and formats by Molinard, Neville, Thomas Clipper, Antica Barbiera Colla). For something different, try a smooth, lubricating shaving oil. Daily razoring puts the skin under a great deal of stress, removing the layer of lipids that keep moisture in the tissue, and leaving the skin more vulnerable to environmental pollutants which can lead to irritation and blemishes. As such, it’s essential that you sooth and protect your face with a good post-shave balm, like Panama 1924, redolent of vanilla and tobacco; Innoxa’s aloe-based concentrate; or Brent Pankhurst’s bracing Ice Gel. Oh, and do use a good, non-plastic tool for the task — a number of excellent, reassuringly sturdy razors are easily attainable. No matter what our polo-necked French friends of yore thought, or indeed, what no small number of contemporary Britons believe (research shows that the majority of ladies in the UK do not shower or bathe on a daily basis, so God only knows about the fellows), body washing MUST be attended to every single day. Maybe twice. We suggest using a vibrant-smelling cleanser that both refreshes the skin and awakens the senses, such as 58 Lifestyle’s Balancing Body Wash, with notes of mandarin, geranium, coriander, jasmine and ylang ylang. Again, please gentlemen, do use the stuff daily. Shampooing, meanwhile, can be handled as infrequently as two or three times a week, depending on hair type. Your hair produces a natural oil called sebum, which shampoo removes — doing this too often can lead to weak, brittle hair. Pretty much only those with oily or dandruff-prone scalps, very fine hair, or who do a lot of exercise or sweaty work might consider a daily wash. The Rake’s range of top-grade shampoos cater to the spectrum of needs and hair types. One of ’em even contains egg and rum (the proverbial breakfast of champions). After your ablutions, apply an anti-perspirant deodorant (yes, you do still sweat in the brisk winter months, particularly under all those woolly layers) — preferably unscented so as not to clash with your cologne. Insofar as that goes, while crisp citrus is perfect for summer, winter calls for woody, musky eaux de toilette. Try Thomas Clipper’s City cologne, with top notes of aromatic tonka bean and a rich heart of cedarwood, or Country, which leads with vetiver and saffron, followed by a melange of sandalwood, ginger and black pepper. Finish the winter grooming regimen with a touch of wind-resistant hair product. Keeping your coiffure in check, hold is important. But as the indefatigably dapper Ulysses Everett McGill (George Clooney) put it in Coen Brothers meisterwerk O Brother, Where Art Thou?, “I like the smell of my hair treatment; the pleasing odour is half the point.” Patricks' matte medium-hold M2, Brent Pankhurst’s Pomade, and David Mallett’s Volume & Styling Spray tick both olfactory and quiff fixative boxes. 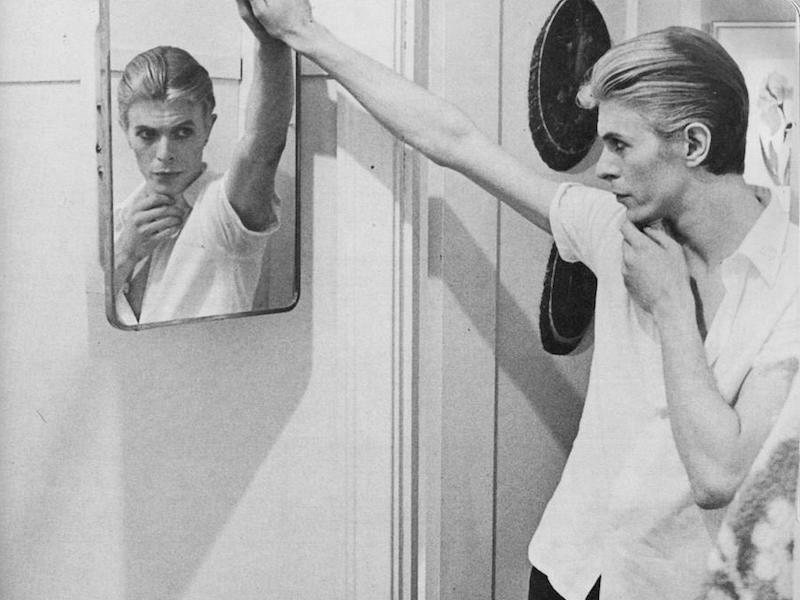 David Bowie poses in front of the mirror in a scene from The Man Who Fell to Earth, 1976.